Steve, I’ve been getting a lot of messages lately (i.e., Tweets, YouTube videos and emails) from someone calling himself Q-Anon. He says he has top secret government clearance, and that he knows about a secret plan among loyal patriotic government officials to take down the bad guys who run the country, and the world, from behind-the-scenes, and that Trump is in on this plan and is helping with it. He says they’re trying to restore America to its original Constitutional status, and destroy the plan by the bad guys to take over the world. He gives constant updates as to the progress that’s being made in restoring freedom. What do you think? 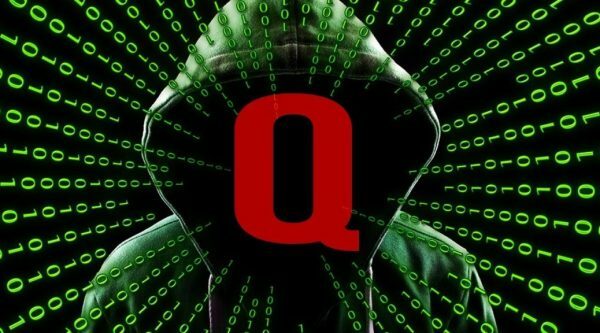 I’ve seen most of the Q-Anon material, on YouTube, Twitter, Facebook etc. But the information in those messages is certainly not Biblical. Nowhere in the Bible does it say the false Jews, “deep state” denizens and other swamp creatures who run this world from behind the scenes are going to get their comeuppance before Christ’s arrival. It’s only at Christ’s arrival that the hidden leaders of this world get their just due (Matthew 13:40-43). So I trust Q-Anon about as far as I can throw him, because his messages contradict the Bible. We both know who the anonymous ones are (the false Jews of Rev. 2:9 and 3:9 who hide behind the title of “God’s chosen people.”). As you know, one of the methods utilized by the enemy (and by that I’m speaking of Christ’s enemies, who are our spiritual enemies as well) is to drag people into their net by presenting little tidbits of truth, and then use those tidbits of truth as the “sugar bait” to get them to swallow their lies. People have been sending me these Q-Anon messages for about a year now. And hardly a one of their sensationalistic predictions have come to pass. Think about it. The sensationalistic but cryptic Q-Anon messages have been about as useful as a daily horoscope message. A “Satan sandwich” is something that purports to be truthful information, but contains hidden lies. It’s composed of two nice big fluffy pieces of bread on the outside (i.e., representing truth), but several hidden slices of rotten pork on the inside (representing the lies they want you to swallow). Think about that. They want you to eat from the crumbs of Q-Anon rather than eat from the “whole loaf” of God’s Word, which tells you exactly how everything is going to end with pinpoint precision, and not cryptic mumbo-jumbo. In short, I just don’t trust Q-Anon. The Q-Anon messages keep saying all of the evil ones are going to be done away with…that thousands of legal indictments are being prepared against members of “the swamp”…that Trump and others are in on this plan…etc. etc. But where’s the beef? Why haven’t we seen any of the stuff Q-Anon has predicted for the past year actually come to pass? If anything, the false Jews and their embedded supporters in government are gaining more and more power. They’re not being “taken down.” Not even close. And again, nowhere in the Bible does it say the evil ones who run this world will be taken down, until the day of Christ’s arrival (Matthew 13:40-43) when their entire world system collapses (Revelation chapter 18) under Christ’s wrath (Revelation 19:15-21). Finally, I’d like to point out that Q-Anon claims to have a top secret “Q Clearance,” and thus is in the loop on top secret, highly classified material. But as many skeptics of the Q-Anon phenomena have pointed out, a “Q Clearance” is only used by the Department of Energy, and it’s for energy-related security matters such as info on the nation’s power grid that we don’t want to fall into the hands of any enemy. That’s hardly the stuff of a global takedown of the evil ones who run this world. Many years ago (mid-1970’s) there was a man who called himself Dr. Peter Beter (I’m not kidding). Dr. Beter gained a huge following among conservatives and patriots with his newsletters and audio tape broadcasts which purported to reveal the “top secret” truth behind many world events. He claimed to be a big shot “insider” in Washington. He even ran for political office at one point. And he gave extremely detailed accounts of conspiracies he claimed were happening at time. He claimed, for example, that the Rockefellers were getting ready to take over America and institute an immediate nationwide dictatorship (again, this was in the 70’s)…that all of the gold in Ft. Knox was gone… and that the Japanese attack on Pearl Harbor was actually planned by American businessmen. You have to be very careful in this world today. Deception is certainly worse now than it was in the 1970’s when Dr. Beter was entertaining (i.e., fooling) conservatives and patriots with his sensationalistic audio and newsletter conspiracies. The very first sign of the end days is rampant deception. I know a lot of people have emotionally invested themselves in Q-Anon and his message. I believe Q-Anon is taking advantage of people’s hopes for a better future, maybe in order to compile extensive online profiles of patriotic Americans who sign up for his messages, or who follow him on social media. As a Bible student, you know better. You know the world is not going to get any better at all, but only worse until Christ’s Second Advent, when all of the evil rudiments truly will be done away with. Nowhere in the Bible does it say that a man like Trump is going to rise up and help overthrow all of the evil ones by using a top-secret cabal of governmental super-patriots. Nowhere does it say those who run the “swamp” are going to be done away with by some secret group of patriots hidden in high positions of government power. And if it’s not Biblical, then it’s complete nonsense. And it’s a waste of good time to follow. Instead, we’re told in the Scriptures that things are going to get worse and worse. That deception will be rampant. And that our only protection — knowledge-wise — is to stick to what the Bible says. It’s God’s Word that tells us how this is all going to end. Not the word of Q-Anon. So be very careful about believing in men. Stick to the Word of God. It quite literally foretells you all things. And you can count on it. God’s Word is not a trail of “breadcrumbs.” It’s the real deal. The whole loaf. And it will never steer you wrong.